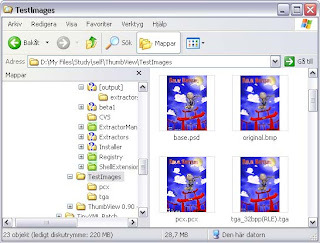 ThumbView is an open source application that enables image thumbnails support in Windows Explorer for filetypes that are not natively supported by Windows. Windows supports thumbnail view of only a handful of image file formats like JPEG, BMP, GIF and some others. Other image file formats which are not supported do not show a thumbnail preview in Windows Explorer. ThumbView will add support to a total of 19 image types - directly inside any Explorer window! CUT, DCX, DDS, MDL, MNG, PCD, PCX, PIC, PIX, PNG, PNM/PBM/PGM/PPM, PSD/PDD, PSP, PXR, SGI/RGB, TGA/VDA/ICB/VST, TIF/TIFF, WAL and XPM. Apart from a thumbnail preview ThumbView also provide a little tooltip window when the mouse pointer is hovered over the image thumbnails. ThumbView Full - Targeted at programmers that want total control over the installed Thumbnail Extractors and make their own. ThumbView Lite - Targeted at normal users that just want to have thumbnails and info tips for 19 image types. They both work on Windows XP/2003/2000, but may or may not work on Windows Vista.